If you haven’t eaten anything with a face on it lately, you might like to try this. Tonight I finally rose to the occassion and made this Chinese dish using the star anise I bought months ago. 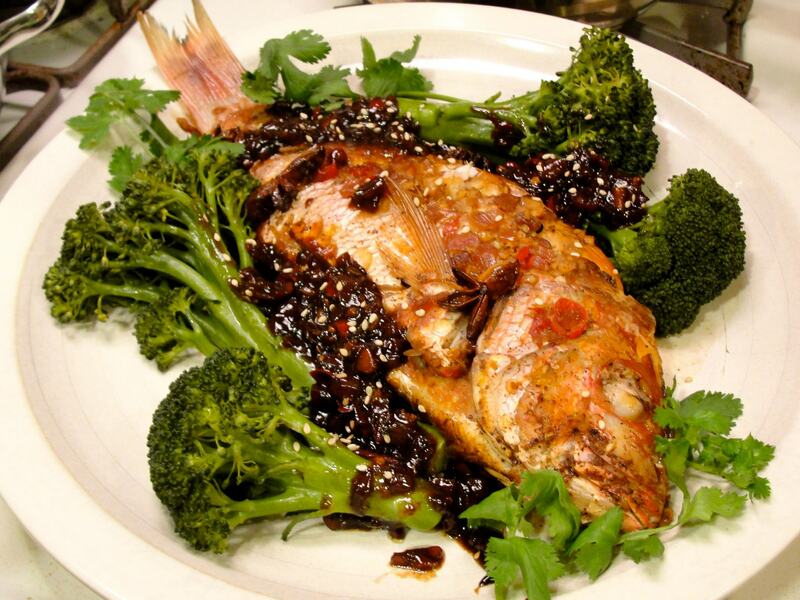 My Chinese friend made snapper something like this – in his dorm room, no less – when I visited him years ago and it was great, so I’ve been meaning to try it myself. To prepare: remove the scales from the cleaned fish (it’s a good idea to do this out in the yard :-), and cut some slits in each side and fill them and the cavity with coarsely chopped fresh ginger and garlic. For the sauce, mix the following in bowl: water (perhaps 1/2 cup), a couple tablespoons vegetable oil, apple cider vineger, soy sauce, fish sauce, brown sugar, chopped ginger and garlic, black pepper, five spice powder, perhaps 5 star anise pieces, 4 hot red thai bird peppers (finely sliced), minced onion (I used red onion because I didn’t have scallions), and bring this mixture to boil in a hot pan. Next, reduce the heat and place the fish in the pan, and cover with a slightly vented lid, cooking the fish until it is opaque and flakes easy, flipping it once half way through (perhaps 5 minutes per side on medium high heat). Move the fish to a serving platter; in the pan, add some corn starch to the sauce and return it to a boil to thicken it. Lastly, I sprinkled the dish with sesame seeds and garnished with cilantro leaves and served it with steamed brocolli and white rice.